Child/Adult Small(Adult Medium, Adult Large). 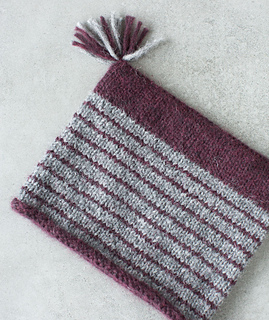 With this free pattern, we aimed for jaunty, playful, and warm—we think we hit the bulls-eye! 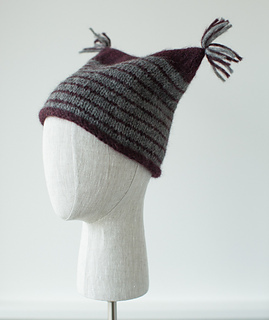 The Striped Tasselled Toque is perfectly easy—in-the-round knitting with a bit of striping and a bit of seaming. But it’s the two tassels that really make us smile. We knit our Toque (rhymes with duke) in the tech-savvy Blue Sky Fibers Techno! It’s a clever, chunky-weight fiber with a core of silken mesh blown through with delicate, baby alpaca fibers. 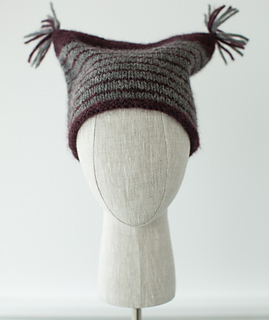 Weightless and lofty, its soft and airy fuzz promises to keep your noggin nice and warm. Approx. 17 (18, 21)“/43 (46, 53)cm circumference. Instructions given for Child/Adult Small; other sizes in parentheses ( ). 2 skeins Blue Sky Fibers Techno (120 yds/109m each): 1 skein each in 2 colors. Designate colors A and B. Our shop sample used A = Color 1989 Wicked; B = Color 1974 Smoke. Or, approx. 100 (120, 144) yds/91 (110, 132)m of an equivalent aran-weight yarn divided evenly between 2 colors. US 9 (5.5mm) 16” circular needles or size needed to obtain gauge. US 7 (4.5mm) 16” circular needles, or 2 sizes smaller than gauge needle. Extra circular needle for 3-needle bind off. 17 sts/26 rows = 4”/10cm in stockinette stitch, after blocking.